My abuela Palmira left this world on March 30th, 2014. She was the last one of my grandparents to leave us. I had been blessed with three sets of grandparents as my father had two sets of parents, his birth parents, abuelo Quino and abuela Margot, and the couple of welcomed him into their family when he was quite young and working away from his hometown, abuelo Jobito and abuela Ester. My maternal grandfather, abuelo Juanito, left us when I was 8 years old but I still remember him very well. Every Sunday afternoon, when the family gathered at their home, he would sit on his rocking chair and tell us funny stories that would make us laugh for hours. Abuela Palmira would stand next to him and laugh with all of us. There was something peculiar about my maternal grandparents. They practiced Spiritism, a religion in which every human being is of sacred worth and where spirits guide us to be in communion with the Great Spirit that is sometimes called God. At their home, everyone was welcomed and celebrated. They never rejected anyone. My grandparents believed in serving everyone and in welcoming everyone without distinction. Although I was too young when my grandfather died and thus not even aware of my own sexual orientation, I know that my grandfather would have accepted me and celebrated me. My grandmother, however, had the chance to know who I am as a whole person and she always, without doubt and without excuses, celebrated me for who I am. 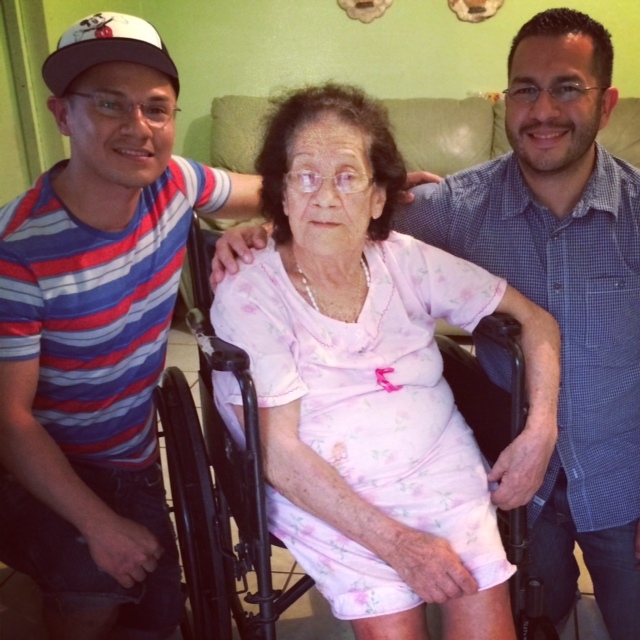 When I think about abuela Palmira, the verse that always comes to mind is that of Psalm 27.10: “When my father and my mother forsake me, then the Lord will take me up.” When my parents rejected me for being queer, it was abuela who welcomed me. She always supported me and celebrated my life. When I introduced her to my now husband, I was told that she spent months telling everyone who would listen about the wonderful man I had met. Recently, while talking with an aunt, she told me how they found among abuela’s personal items the wedding invitation I had sent her for my marriage. I knew she would not be able to attend my wedding due to health problems, but she had kept that invitation as an important memento. Through these actions, I can say that abuela embodied the Holy One in my life. Thus, when my parents disowned me, God took me up through the love, support and affirmation of my abuela Palmira. The Sunday before abuela departed this world, my husband and I spent time with her. We had been in Puerto Rico for vacation, and of course I had to go visit abuela. She made us laugh with her witty remarks. This was abuela. She was always making jokes and laughing about things, even when her health wasn’t the best, she always found joy in living. I am not naïve to say that she was perfect, because none of us are. She had her flaws and made mistakes like the rest of us. But her love and support meant the world to me, and it is those values that will stay with me throughout my life. Her love, her support, her laughter that last time I saw her will always be the manifestation of God in my life. I will keep her memory alive as long as I live and I will always share with the world the values that she shared with me. Abuela Palmira, you are now gone from us, as you would have said, you are now “unfleshed”, but your spirit will continue to guide me just as the spirit of abuelo Juanito has never left me. Gracias por todo, abuelita. On Saturday was my wedding. As the minister was preaching, our two-years old nephew danced in front of us, and then approached my husband to sit on his lap. I looked at the first row of chairs in the sanctuary, where my husband’s family was sitting, and noticed that our six-years old niece wanted to move and join us to. I did what I thought was appropriate: I signaled her to come forward and sit with us. There we were; my husband holding our nephew on his lap, and me holding our niece on my lap. Then I looked around and saw my new family. There was my brother-in-law and his (female) partner, my husband’s cousin and his girlfriend, and a couple of friends who have been like brothers to either my husband or me. There was not a single one of my blood relatives. None could be there for different reasons and my parents and sister have already decided I am not part of their lives. But as I was looking around at my new family, I realized how “family” is such a wonderfully diverse reality. People talk about “traditional families” as if there was always such thing. In reality, families have always been diverse. There is no such thing as a “traditional” family. There is ideal of family. Our families come in many forms and expressions. I looked around and saw how my family present there was the “new normal” if you will. My brother-in-law and his partner have been together for many years but are yet to get married. He is raising her eldest daughter, who spends time with her birth dad and his family every other weekend. Our nephew was born two years ago, the product of the love of my brother-in-law and his female partner. Then, there was my husband’s cousin, who is dating a lovely, young, white American woman who speaks no Spanish (believe me, that in itself is a HUGE thing!) They were attending the wedding of two men who had decided to commit to each other and to love each other.